Quickly and easily add decadent flavor to anything you make with this Monin 64 oz. white chocolate flavoring sauce! This versatile sauce can be used as an ingredient, topping, or garnish for your top-selling drinks and desserts. Featuring a sweet white chocolate flavor, this sauce has a thicker consistency than liquid flavoring syrup. It's great for swirling atop whipped cream or blending into frappes. It adds just the right amount of sweet flavor to any cup of freshly-brewed coffee. You can even use it to top ice cream, cheesecakes, and other signature desserts. Smooth, white chocolate sauces that is top notch! I also bought the pump to add to the bottle and it dispenses about 1/2-1 tbsp per pump and works awesome for drizzles on our homemade specialtiy deserts! This sauces is so pure and natural that its like consuming a liquid candy bar! I'm not a huge fan of white chocolate but my wife love white chocolate mochas. So I picked up and bottle and I have to admit it's pretty good! The best White Chocolate Sauce on the market....it's thick, full of flavor and in our opinion nothing compares to Monin products for espresso bar service! The best white chocolate flavor on the market. I've ordered direct from Monin, and the price here is actually a little cheaper. As long as you're buying several at a time, the shipping is worth it! 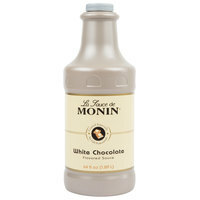 We have used this Monin white chocolate sauce for several of our seasonal drinks. It has a smooth taste and is a low price for the quantity. We will continue to keep this stocked in our shop. We use the white chocolate sauce in our espresso-based drinks. You can't beat this price that Webstaurant is offering to their customers! Each case of 4 that you buy comes with a sauce pump - other sites make you purchase the pump at an additional cost. We use this to make white mochas in our coffee shop. It's a very popular flavor. The sauce isn't too thick, allowing it to be pumped out easily. I like this white mocha and the price. Its not amazing but it is a decent white chocolate sauce. I will continue to order this white chocolate until I find a sauce more similar to the name brand sauce. The Monin white chocolate flavoring sauce is very delicious and terrific for decorating our dipped apples and fudge. The sauce is very creamy and delicious. Terrific white chocolate sauce that is ultra creamy and decadent. Great for drizzling over fresh cut strawberries for an easy snack the kids love. Great sturdy bottle and easy to store. We used to get our supplies directly from our vendor, which meant even more mark ups to the cost. However, once we tried out this Monin product, and then others, we were sold on the lower cost for more product. I definitely recommend if you haven't yet, because the product is just as good as the name brand! Very on point with the flavor, it's just not as powerful as I hoped it would be. I use this mostly on mochas and it tastes good but you need to use a little more than of it to get the same powerfulness as other ones I've tried. Good taste though! The white chocolate flavoring sauce is a great item and is great for our coffees and making our spreads for our bagels. Super rich and decadent flavoring sauce. Excellent white chocolate sauce! Makes white chocolate mochas taste so much better than Torani. Our coffee shop has had this product for over a year and no complaints at all! Great quality and top notch flavoring sauce for making our white chocolate raspberry mocha. A great style sauce and great to use with our pump. The Monin white chocolate flavoring sauce is amazing. A very luscious sauce that is great for topping our cakes and pies. A great dessert sauce. A great priced white chocolate flavoring sauce. The monin brand is great and we love the rich flavor of the sauce. Great for making coffee taste great. I am generally not a fan of white chocolate, but I ended up buying more of this stuff because of how quickly I went through this bottle. My daughter loves white chocolate so we gave this brand a whirl. It is delicious and now she can make her own white chocolate mochas at home. The Monin white chocolate flavoring sauce is top notch. The sauce is very sweet but goes really well with coffee and espresso. Love the sweet kick it adds to our coffee style beverages. some really nice sauce. i use it alot in coffee, and in cold blended drinks, cannot bekive how much cheaper in price it is than the stores. It is always a good idea to have this white chocolate flavoring sauce on hand if you operate a frozen yogurt or ice cream shop. This stuff flies off the shelf. It is by far our most popular dessert sauce. Great product for our coffee shop! This is a fantastic white chocolate product when you are looking to make white chocolate mochas, white hot chocolates, or any other specialty drink! this flavor not bed. we just to buy this to compare with other brand. i think we will go with other brand white chocolate sauce because Ghirardelli has more deep white chocolate flavoring in it. but this product is not bad !! Warm fluffy pancakes are amazing when we drizzle this decadent white chocolate flavoring sauce over them and freshly sliced strawberries. No syrup is required when using this flavorful sauce. Very indulgent and rich. It goes great in coffee or on ice cream. I love this - it tastes like the real deal. Try it on everything. What's better than to have a white syrup that taste like chocolate?! A twisted surprise our customers like to call it. Perfect with mint drinks! This is a pretty good white chocolate sauce, but it's a bit lack luster. The taste is kind of mild and the sweetest is a bit too much. But for a basic white mocha, it gets the job done! I love the dark chocolate version of this, but this one is lacking something. It's sweet, and the quality is good, but the "chocolate" part doesn't come across in coffee, which is mainly what I use it for. The price is still fantastic and I like Monin products but I will skip this one next time. Monín 64 oz. White chocolate -flavored salsa is amazing, we love this product, it's handy to grind it with the blender. we love it because the White Chocolate is very creamy. This one tastes exactly how you'd expect a white chocolate bar or white chocolate treat to taste. I'm very impressed with the flavor as well as quality of the product. Very good. Much better than most white chocolate sauces/syrups out there, it actually tastes LIKE white chocolate, even has a bit of a buttery aftertaste like real white chocolate bars. I mixed this chocolate macadamia, and Suisse choco coffee creamer, and also just did a video of me brewing espresso, mixing my fixings including Monin white chocolate sauce, and another syrup as well as other needed ingredients, check videos if you'd like. I refrained from adding audio because I just basically transcribed it in video description for the hearing impaired, I don't have the means to create subtitles, otherwise I would've. Delicious Product at a crazy low price, if you're even just going to try it to see if you like it, I'd suggest from this site, they have good expiration dates and a huge discount compared to anywhere else you're going to find this product for sure. Many white chocolates are hard to find that are natural AND true to taste; Monin implements both in their white chocolate sauce. we are able to use these on pastries and cakes alike, as well as in-home frappes that we create. Monin products are great. We use this in our drinks but we also use it as drizzle on top. It tastes great and is a great value. The Monin White chocolate sauces is great. It has a good flavor and works well with our cafe's coffee products. Can't go without white chocolate in our lattes and frappes!